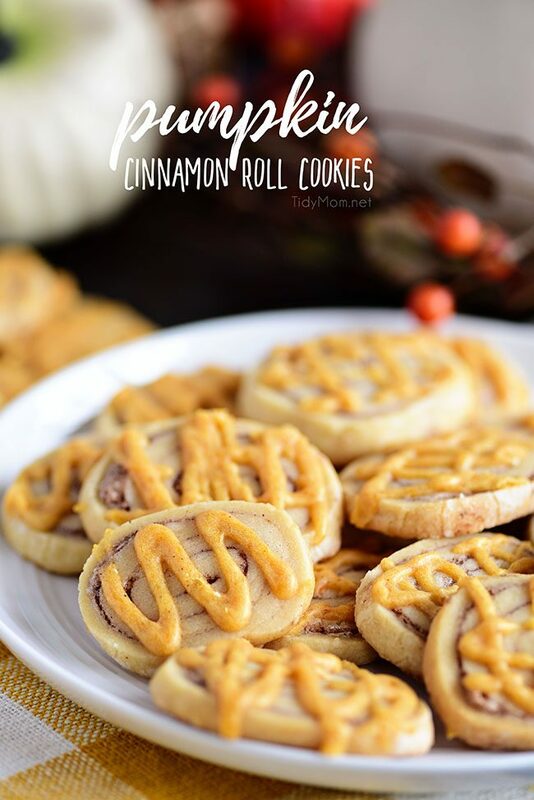 These Cinnamon Roll Cookies are full of pumpkin spice and everything nice! The pumpkin glaze on top makes them an irresistible fall treat. We love fresh-baked homemade cookies like the best Chocolate Chip Cookie recipe, Peanut Butter Cup Cookies and Gooey Butter Peanut Butter Cookies. You know how in Cinderella the carriage turns into a pumpkin at midnight? Well, that’s me the minute the calendar hits October. I’m waiting for the day where I wake up with bright orange skin and a stem hanging out of the top of my head. 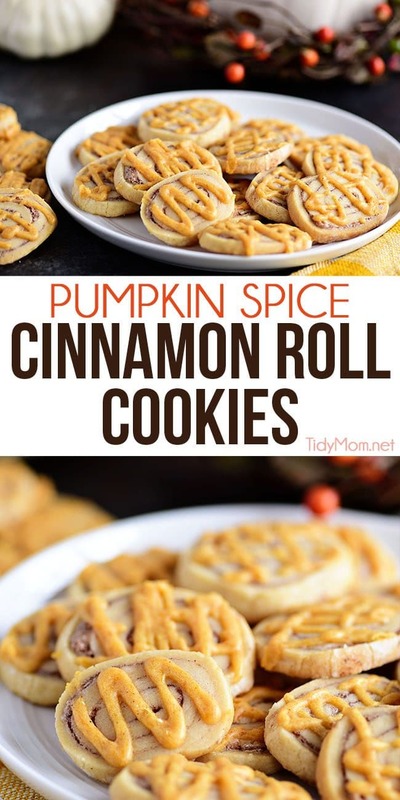 I love turning anything I can into a pumpkin dessert, and cinnamon roll cookies are my current victim! 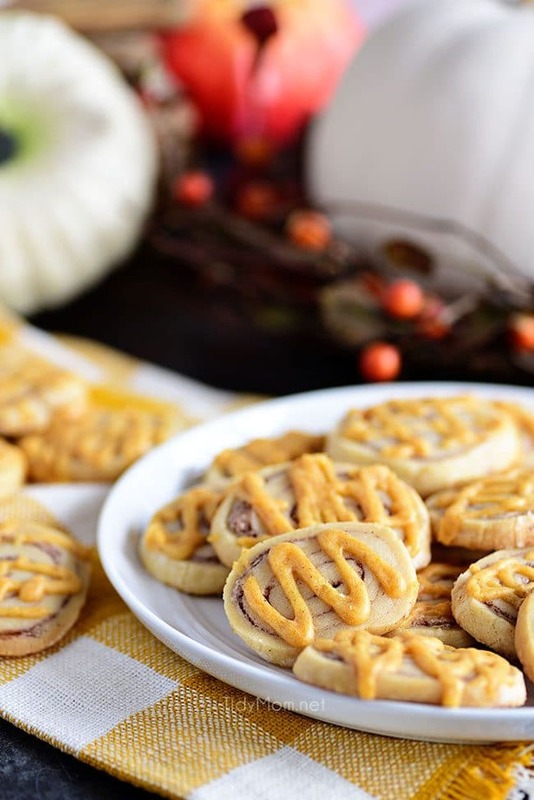 These cookies are the best of everything I love with swirls of cinnamon, hints of vanilla, and a drizzle of pumpkin icing perfectly complementing an amazingly soft shortbread cookie. 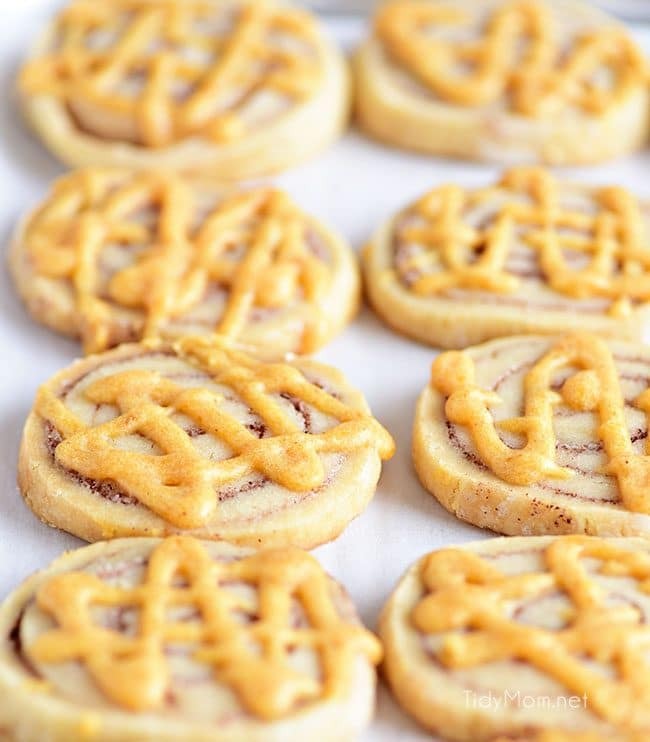 The pumpkin icing adds the perfect extra dose of sweet to make these cinnamon roll cookies a true slam dunk. A recipe this easy and delicious will leave you saying ‘see ya later” to any store-bought holiday cookies from here on out. Using an electric mixer, combine sugar, butter, vanilla extract, salt and flour to make cookie dough. Flatten dough into a disk and chill at least 1 hour until ready to use. Using a small bowl whisk an egg white and water until foamy and set aside. In another small bowl combine sugar and spices and also set aside. Lay the chilled cookie dough disk out on a dusted surface and roll it into a 19″ x 12″ rectangle. Brush the egg white mixture all over the rolled dough and sprinkle spiced sugar mixture evenly over the top, then gently roll the dough into a tight log and freeze until firm. Remove the dough log from freezer and slice into 1/2-inch slices and place on lined baking sheet. Bake until very lightly golden on top. While cookies are cooling, prepare the pumpkin glaze. Once cookies are completely cool, drizzle the icing on with a spoon. 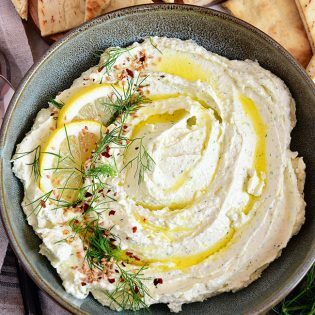 Combine the softened cream cheese and butter using a stand mixer until well blended. Add in the vanilla and the powdered sugar and beat until combined. Beat softened butter in a stand mixer for about 1 minute, or until smooth. Add powdered sugar, maple syrup, vanilla and dash of salt and mix for 10 seconds. While the mixer is still running add the milk, a little at a time until you have the desired consistency. Then beat the frosting for about 1 minute. Chill the Dough: Refrigerate your dough for at least one hour before you roll it out. This allows the ingredients to soak in a little better and makes for an easier rolling experience. Dust with Powdered Sugar: To avoid sticking, make sure you powder your workspace first. I use powdered sugar instead of flower to preserve the sweetness of the dough. For a detailed description on the best way to roll cookie dough check out my Holiday Cooking Baking Tips post where you’ll find a full tutorial. Freeze Dough Log Before Slicing: To achieve that perfect round slice when cutting your cookies, it’s important to freeze the rolled up dough. The frozen dough will allow for a more precise cut, leading to picture perfect cookie slices. If you loved these tips and could use even more cookie info, you’ll love this post dedicated to all of my favorite Cookie Baking Secrets! 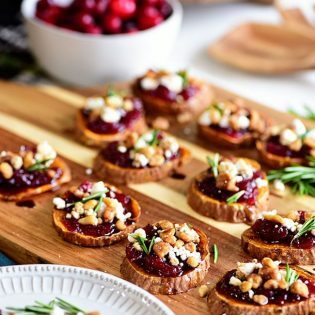 It’s a life-saver especially once holiday baking comes around! Can you freeze decorated cookies? YES! Even if cookies have frosting or glaze you can still freeze them. Do this by placing each completely cooled cookie in a separate zip-top bag, and place all the bags in an airtight container to place in the freezer or just place the bags in the freezer. You can also place the cookies in a single layer of an airtight container and use parchment paper to stack each layer in the container. 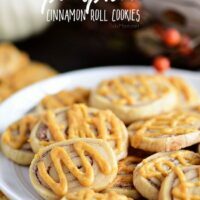 How long will cinnamon roll cookies stay fresh? Pumpkin Spice Cookies with White Chocolate Chips are soft, delicious and loaded with chocolate chips and pecans. If you haven’t had a pudding cookie, you don’t know what you’re missing. 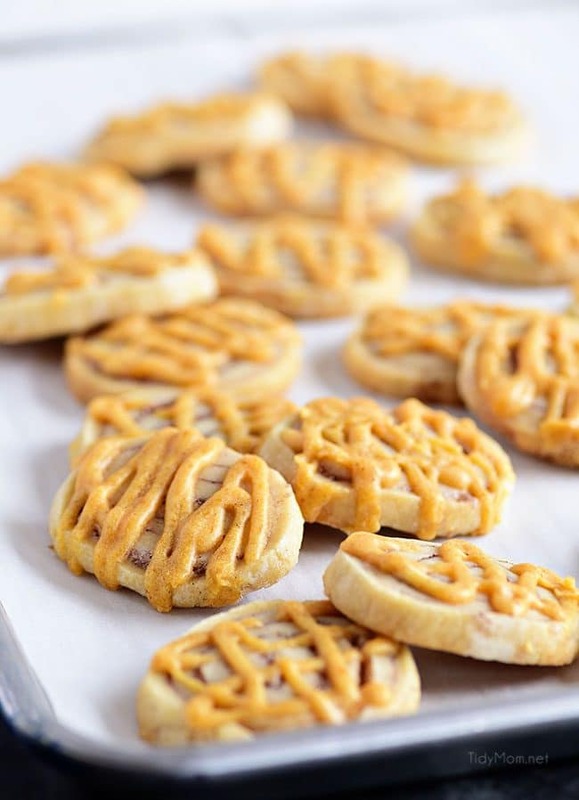 Rolo Stuffed Peanut Butter Cookies the BEST peanut butter cookie recipe stuffed with a gooey Rol0 caramel candy. These are PERFECTION. White Chocolate Chip Sugar-Doodles the perfect mashup of our favorite cookies; the buttery goodness of a sugar cookie with the chewy texture of a snickerdoodle. Almond Joy Cookies need just four ingredients and don’t even require a mixer! No beating, no chilling, just mix ’em up and throw ’em in the oven EASY! You’re going to love these ooey gooey fabulous cookies! Hot Fudge Filled Lava Cookies are soft and tender chocolate cookies with a surprise of gooey hot fudge waiting on the inside. If you like lava cake, you’ll love these! 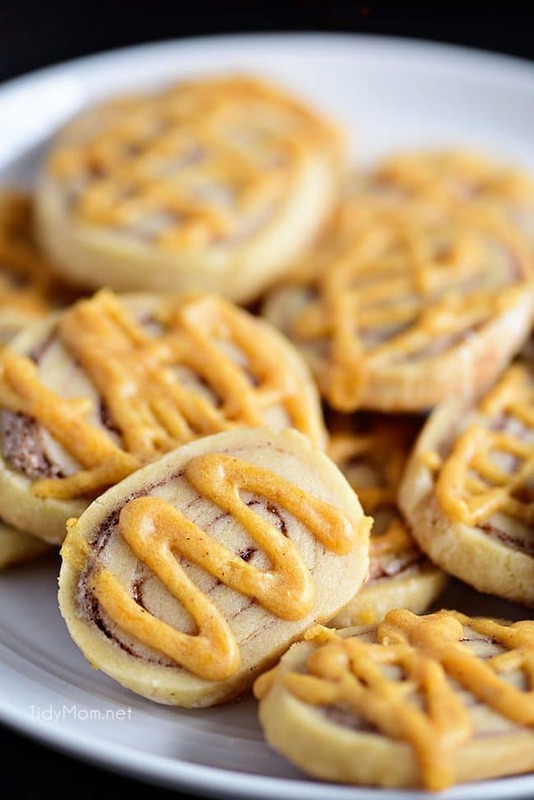 Like This Cinnamon Roll Cookie Recipe? Pin It! In a medium-sized mixing bowl using an electric mixer, cream together the sugar, butter, vanilla, and salt. Add the flour and continue mixing until just combined. Remove cookie dough from bowl and flatten into a disk, wrap it in plastic, and refrigerate until ready to use — at least 1 hour. In a small bowl whisk egg white and water until foamy and set aside. In another small bowl combine sugar and spices and also set aside. Lay the chilled cookie dough disk on a piece of parchment or wax paper lightly dusted with powdered sugar and roll it into a 19" x 12" rectangle. (if the dough is too hard to roll out, let it come to room temperature a little before rolling). Tip: when rolling out cookie dough, I will roll out dough between two pieces of parchment or waxed paper - just be sure to dust the top of the dough with a little powdered sugar before placing parchment paper on top. Brush the egg white mixture all over the rolled dough and sprinkle spiced sugar mixture evenly over the top. Starting with a long edge, use the parchment to help you gently roll the dough into a tight log. Press the edge to seal (or brush the edge with some of the egg white to seal). For ease, cut the log in half and wrap both halves separately in plastic wrap. Freeze until firm, about 30 minutes to 1 hour. Preheat oven to 350° F. Line a baking sheet with parchment paper, set aside. Remove one dough log from freezer. Using a sharp knife, slice dough into 1/2" slices and place on lined baking sheet. Bake for 12-14 minutes or until very lightly golden on top. Allow cookies to cool on baking sheets for 3 minutes before transferring to a wire rack to finish cooling. Repeat this process with the second log of dough. 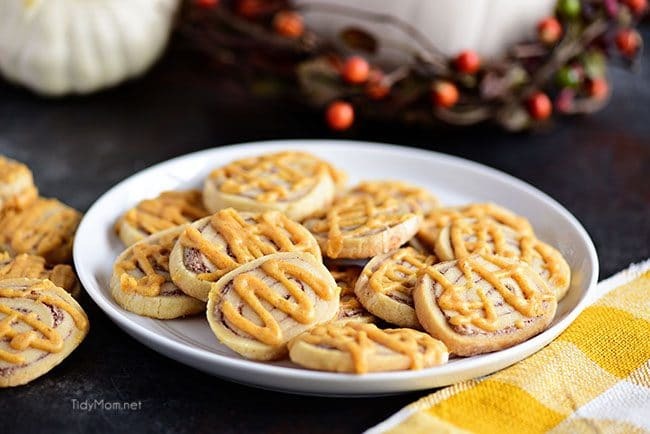 While cookies are cooling, prepare the pumpkin glaze by whisking powdered sugar, milk, vanilla pumpkin, pie spice, and butter until smooth. If the glaze is too thin, add more powdered sugar. Once cookies are completely cool, drizzle the icing on with a spoon. When cool, store airtight, at room temperature; freeze for longer storage.